The first ones here is also a somewhat common one. A small winemaker who wants a small quantity of wine labels for their private or semi-private vinatge. The challenge with these are that they need to keep it low cost and somewhat simple for the few labels they need, yet get the look and style they want. So in both of these we have standard theme in which tthey follow now for multiple vintages and they have consitantly been happy with the outcome. 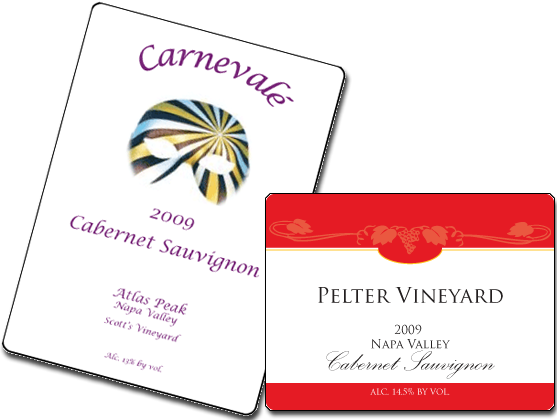 Pelter Vineyards is the private brand of Calistoga Wine Stop. With a growing request for their Cabernet they have grown in how many they ask for, but kept the nice clean look I cam up with. As for Carnevale, this is a private label that is a custom blend and bottled at Judd Hill and is considered such a striking label that they showcase it.